'Belcaro', the Frank Norton Hoffstot estate designed by Mortimer Foster c. 1910 in Sands Point. Hoffstot was president of the Pressed Steel Car Co. and the Clinton Iron & Steel Co. He was also president of the National Bank of America and a director at the New York Trust Company. In 1910 Hoffstot was indicted in Pittsburgh for bribing an ex-Select Councilman, a charge which he spent the next year fighting and was eventually acquitted in 1911. 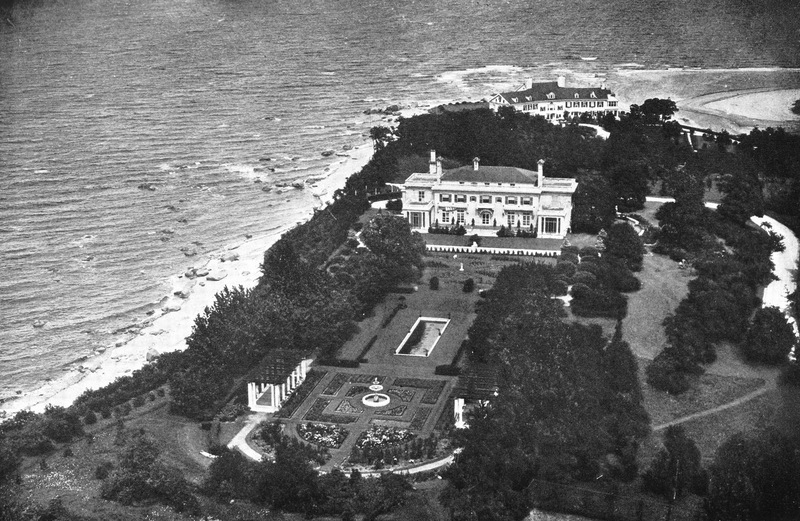 'Belcaro' was demolished in the 1950s. To say nothing of the tragedy that befell Belcaro---and the entire neighborhood. Agreed with the prior remarks that the home while grand looked to have been perhaps more manageable than others. I like how its perched there with the ability to enjoy the gardens just as much as the water views. Per a brief article on Hoffstot in the Pittsburgh Post-Gazette he died Dec 23, 1938 "at his home in New York City". His association with the Pressed Steel Car company he founded ended in 1933. John, a Princeton man, at his death was a member of the Ocean City Yacht Club (NJ), Westmoreland Polo and Hunt Club, University Club in NYC, etc with both a noted in city home and country estate that per the 1930 census was "valued at $20,0000". I seem to recognize the house on the point, just beyond Belcaro, from previous posts by you. Would you identify it? What an enviable location! Did anything good happen in the 1950s architecturally speaking? It seems surprising that this house is oriented toward the garden, lovely as it is, with only the short end facing the water. "It seems surprising that this house is oriented toward the garden, lovely as it is, with only the short end facing the water." I was chalking that up to a century's worth of sensibility differences. [Today's homeowner would want the view in his FACE.] But now I'm trying to figure something out. Land's End/Kidd's Rock out there on the tip was built ca 1910. Belcaro was designed [built?] the same year. Belcaro's frontside seems to be facing Kidd's Rock, the visible drive at far right being the point of arrival for Belcaro. Did Hoffstot design/build Belcaro without the known presence of Land's End out his front door, thinking the front of his place was going to grandly overlook the sound? Surely he knew who owned the land he'd be fronting on? Or did he? Was Land's End already in place when Belcaro started? Maybe Zach has already addressed this point deep inside his extraordinary Land's End coverage. I shall go look. I also find it odd how this house is situated. But Kidds Rock must have already have been there, because if not, it would have made more sense to build Belcaro on that site. I've said this before, if you look at the sites of many of these estates, I wonder what type of planning really went into the zoning and property lines. Many of them seem so damn odd and don't make any sense. Very hap-hazard. I think I once remember that Gary Lawrence said he may of had some interior shots of this estate. Does anyone know if he posted them on his blog? I think the orientation is spectacular with an expansive waterview when you drive up to the front door also waterviews from some principal rooms and a gloriously deep garden to enjoy creating beautiful vistas of its own. Great use of a long an narrow plot that is running parallel to the water.